DIY Marquees is certainly renowned for the excellent quality and variety of marquees which we can provide however the Deluxe Demi DIY marquee range is a range of marquees and our pride and joy. While we love all of our marquees and know that our customers will always be satisfied with any of the large range that we offer, we have to admit that there’s no beating the DIY Demi Marquees for sale at DIY Marquees. And our customers love our Demi Marquees as much as we do! And its easy to see why. The Demi Marquee range is the ideal because of its functionality, durability, flexibility, stability, strength, compatibility and most importantly, its affordability. The range is impressive to say the least, and boasts features much like our commercial range but with additional features which makes it a cut-above-the rest. 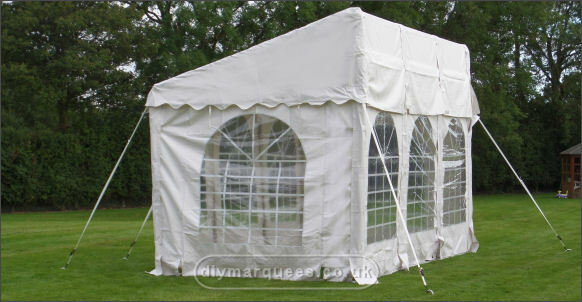 Features of this marquee include, rip-stop material to combat high winds and for extra protection against the elements; made of PVC which is the most suitable material for a marquee because of its durability; Velcro strips securely tape together to further prevent the elements dampening your evening; the framework is made entirely of steel pipes which provides a strong and stable material to form the basic structure of the marquee, for protection of your guests and peace of mind; braces at the leg and eaves designed perfectly scientifically to counter-act balance and pressure which may be exerted on the outer structure or framework of the marquee; and finally but by no means least, the heating capacity of the marquee is the best as a result. Marquee heating is an essential consideration throughout most of the year in the UK. Marquee heating options are discussed in greater depth on our informative website. Consider all these advantages already mention in the Demi Marquees for sale and you would imagine that it simply cannot get better. But the best is yet to come because this range has certainly been designed with both form and function in mind because this range, in addition to the fine structural attributes already in place, is also highly compatible. Meaning, that the Demi is not only compatible with existing structures such as other buildings and toilets, which makes the Demi range super simple and easy to place no matter what size you choose. But it is also compatible with other types of marquees, meaning that it is the perfect marquee to use in conjunction with any other style. Size-wise, you couldn’t ask for more. Consider seating 70 to 80 guests at a round table and we would say to you that you need to consider the Demi range as this is the best option for such an event. If your round table event requires provision for a buffet area or a dance floor, the capacity can easily be reduced to make allowances. There is no event or function for which we believe the Demi would not be suitable.